Description: The Apostle Paul was the greatest early missionary of the Christian gospel. He was also, by his own admission, an Israelite. How can both these realities coexist in one individual? This book argues that Paul viewed his mission to the Gentiles, in and of itself, as the primary expression of his Jewish identity. The concept of Israel�s divine vocation is used to shed fresh light on a number of much-debated passages in Paul�s letter to the Romans. 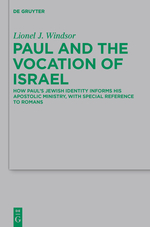 Citation: Michael F. Bird, review of Lionel J. Windsor, Paul and the Vocation of Israel: How Paul�s Jewish Identity Informs his Apostolic Ministry, with Special Reference to Romans, Review of Biblical Literature [http://www.bookreviews.org] (2016).